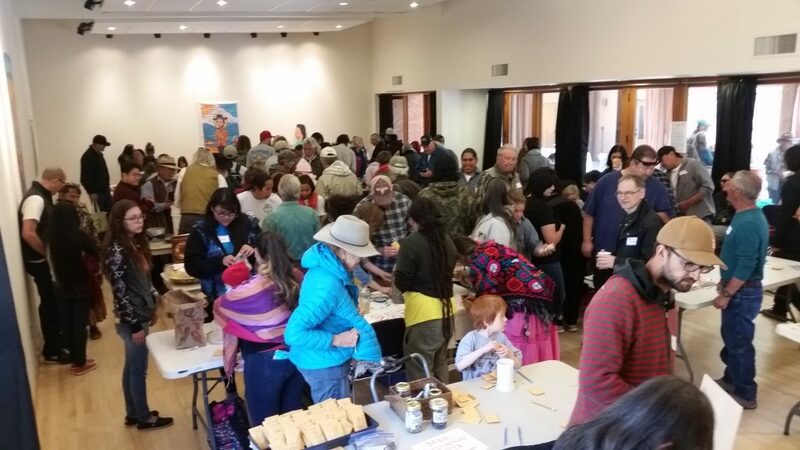 On Earth Day, April 21, 2018 over three hundred farmers and seed savers rejoiced the gifts of our ancestors for the 13th Annual Owingeh Ta Pueblos y Semillas Seed Exchange. 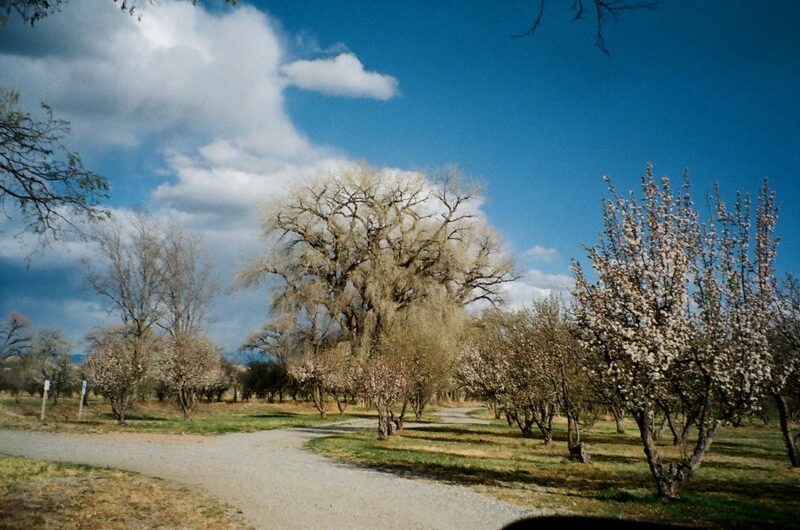 People from near and far gathered at the beautiful Los Luceros Ranch to be enveloped by the hundreds of apple tree blossoms and the Acequia Madre de Alcalde flowing with grace. 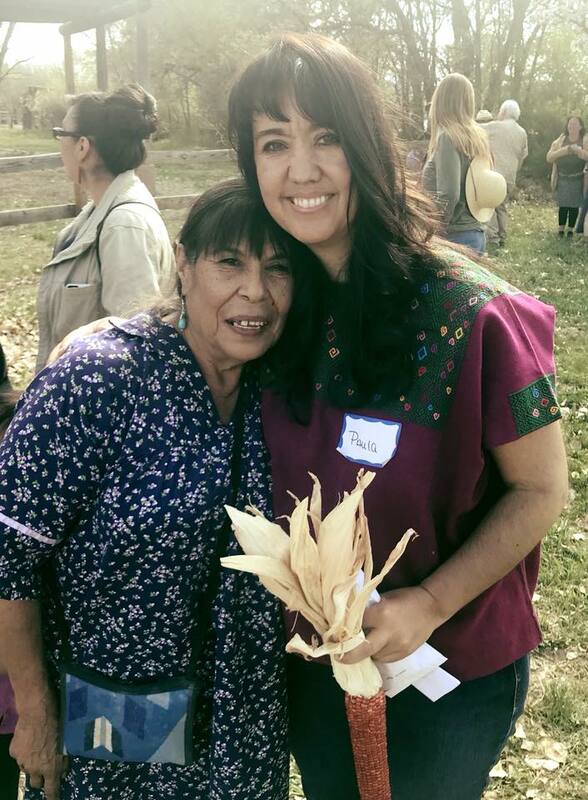 The gathering was a celebration of the sacred traditions of farming and seed saving with the mission of reconciliation, healing, and honoring the history of the land based people of the Rio Grande Valley. To open the day, Marie Markestyn provided a historical background of the indigenous Pueblo communities and waves of colonization and settlement that came with the Spanish, Mexican and later American people to Northern New Mexico. Marie set the tone for the gathering with the call to be truthful about this history in order to heal wounds of the past. The ceremony began with a prayer for rain to our Patron San Yisidro by Los Hermanos Penitenties de La Morada de Nuestro Señor de Esquipula (Chimayo), La Cofradia de la Santísima Trinidad (Santa Cruz), La Morada de San José, y otras Moradas. Following the alabados, seed, earth and water offerings which were brought from all 4 directions, the Rain Dancers from Santa Clara Pueblo blessed with their dance and song. In the afternoon, we were also honored to have Josiah Enriquez from Pojoaque Pueblo with the Lightning Boys Foundation close the sacred circle with a Hoop Dance. The NM Food and Seed Soverignty Alliance awarded Madeline and Fidel Naranjo with the Anciano Se:daa Lifeways Award for their outstanding contribution and commitment to teaching their family, community, and others about the sacredness of seeds and cultural life-ways. We also had powerful presentations by Ralph Martinez of San Pedro, “Un Valle Unido y Fuerte” and Paula Garcia, of the NM Acequia Association regarding the Seed Bill HB161. Ralph gave a very personal and compelling testimony about his battle with addiction and how important plating seeds of resilience and healing in our communities is so important. Paula Garcia discussed the history of the NM Food and Seed Sovereignty Alliance and House Bill 161 as it appeared to be the handiwork of the biotech industry, which was attempting to prevent local governments from enacting regulations on the cultivation of seeds. Marian Naranjo of Santa Clara Pueblo closed the gathering with a prayer for all those living within the sacred mountains to respect them as the Tewa church, honoring our past and working toward healing and reconciliation as land based people. All of the families and individuals who brought seed — you are our reason and inspiration for this gathering! American Friends Service Committee, Communities for Clean Water, Los Sembradores, Priscilla & Raymond Romo, Los Rios River Runners, Sprouts, Iconic Coffee, Four Bridges, Better Day Coffee, Eve’s Farm, Sage Bakehouse, Emily Arasim, Gilbert & Rosa, Ghost Ranch, Shane Tolbert, Richard Barnard, Tesuque Pueblo Farms, Plants of the Southwest, Eloy and Frances Trujillo, ABQ Costco, Albertsons, Santa Fe Farmers Market Gift Shop, La Mesa Organic Farm, La Cocina, Newman’s Nursery, Herbs Etc., Farmhouse Café and School Lunch Program, Espanola Community Market Co-op, Buckin’ Bees Honey, Second Blooms Farms, Sembrando Semillas de Chamisal, Cids Supermarket & Lore Pease. What Can I Do To Protect My Water Rights In Drought Years?